Working with Bob Smith (a fellow researcher from Boston) we studied pages from a Rindskopf catalogue from the 1920s - and that was when the discoveries began, as on page after page, we recognised patterns and shapes that had previously been reported in Carnival as “maker not known”. In 2001 few Carnival Glass collectors would have heard of Josef Rindskopf. 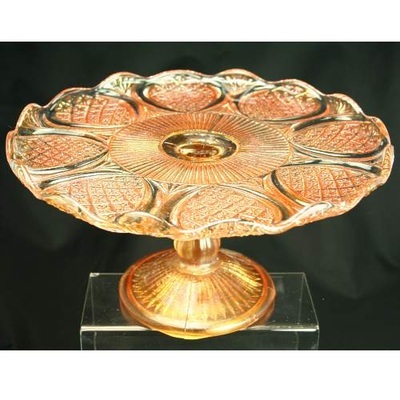 Those who might have known were probably Czech Art Glass collectors who recognised Rindskopf as a producer of fine blown art glass in styles similar to those made by Loetz and Moser in the early 1900s. Possibly the biggest “eureka moment” was when we found the Classic Arts and Egyptian Queen patterns (ashown on the right) in those catalogue pages. As we said at the time, it felt like “walking on freshly fallen snow”. We uncovered piece after piece that Rindskopf had made, and we documented the whole fascinating story, plus many illustrations and catalogue extracts in “A Century of Carnival Glass” and the NetworK Czech Special. Josef Rindskopf (later Riethof) was born in 1829. He married an American, Fanny Phillips, and in 1876 became co-owner, with several of his brothers, of a glass works called Brüder Rindskopf (Rindskopf Brothers) in the spa town of Teplice (Teplitz). A year after his death, in 1891, four of his sons (Sidney, Albert, Edwin and Sherman—note their American/English names) established a new company called Josef Rindskopf's Söhne A.G. (Josef Rindskopf's Sons) at Kosten. Soon after, factories at Dux and Tischau (all near Teplice) were added and were principally used for the production of mainly ornamental art glass. 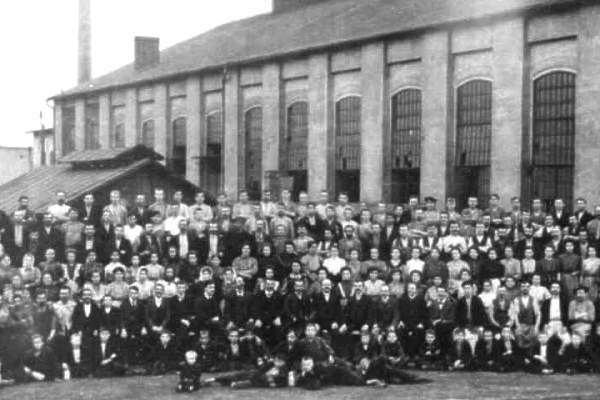 After a serious fire, the factory at Kosten was re-built in 1903, with state-of-the-art machinery for efficient mass production of huge quantities of glassware, its own water systems, high pressure ventilators, modern compressors, and facilities for semi-automatic glass production. Additionally, they made of all their own iron moulds. Around 400 to 500 glass workers were employed. The company had a hard time after World War One, and after 1920 they began to concentrate on the less expensive, pressed glass. This would have been where their Carnival Glass items were pressed and iridized, alongside clear flint glass items, ready for export. In 1927 Rindskopf declared bankruptcy, and later, a merger with Inwald took place. Our research revealed that a wide range of Carnival Glass was made by Rindskopf. Quite possibly this was an attempt to capitalise on a style of glass that was still enjoying general appeal in Europe at a time when the output from the USA had all but dried up. 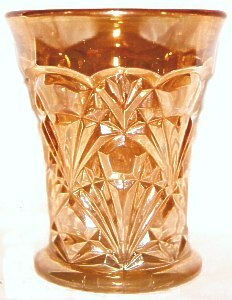 Rindskopf’s Carnival Glass is found primarily in marigold, with occasional items being found on yellow or amber base glass. The quality of both glass and iridescence varies tremendously, perhaps reflecting the fortunes of the company. Incredibly, in 2004 we made contact with a descendant of Josef Rindskopf - his great grandson, Professor Fred Ridley. We are greatly indebted to Fred who provided much information and some astonishing photographs (some shown below) from a family source. They present a picture of the production of pressed glass (which includes Carnival Glass) through the 1920s into the early 1930s by means of a photographic record like no other. The illustrations represent a previously unpublished wealth of visual information showing the factory floor, the equipment, the processes involved, and most intriguingly of all - the people. Clockwise from the top left, these amazing pictures show: the factory and part of its extensive workforce; the mould shop; the washing/cleaning operations (in preparation for packing and export); and glassmaking on the factory floor. Read and See More about Rindskopf - click on any image.